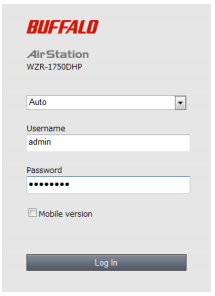 These instructions are for the Buffalo Airstation WZR-1750DHP / WZR-1166DHP. Have a different Buffalo router? Submit a support request so that we may further assist you and add your router to the guide! 1. 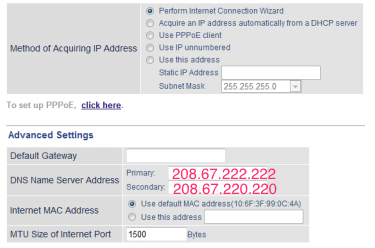 Visit the router's IP address (http://192.168.11.1) in a new browser window. 2. The prompt "Enter username/password" screen will appear. By default, the username is "admin" and the password is "password". 3. 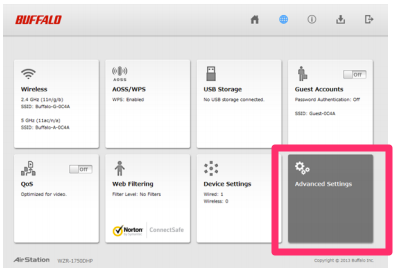 On the Home screen, click on "Advanced Settings". 4. Click on "Internet" and enter 208.67.222.222/208.67.220.220 in the DNS server field.